On September 6, 2007, shortly after midnight, Israeli fighters advanced on Deir ez-Zour in Syria. Israel often flew into Syria as a warning to President Bashar al-Assad. But this time, there was no warning and no explanation. This was a covert operation, with one goal: to destroy a nuclear reactor being built by North Korea under a tight veil of secrecy in the Syrian desert. 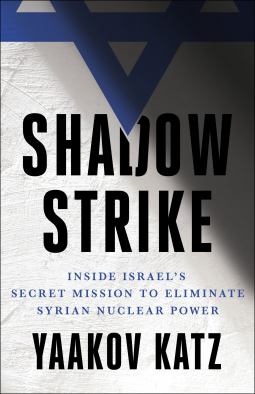 Shadow Strike tells, for the first time, the story of the espionage, political courage, military might and psychological warfare behind Israel’s daring operation to stop one of the greatest known acts of nuclear proliferation. It also brings Israel’s powerful military and diplomatic alliance with the United States to life, revealing the debates President Bush had with Vice President Cheney and Israeli Prime Minister Ehud Olmert as well as the diplomatic and military planning that took place in the Oval Office, the Prime Minister’s Office in Jerusalem, and inside the IDF’s underground war room beneath Tel Aviv. These two countries remain united in a battle to prevent nuclear proliferation, to defeat Islamic terror, and to curtail Iran’s attempts to spread its hegemony throughout the Middle East. Yaakov Katz's Shadow Strike explores how this operation continues to impact the world we live in today and if what happened in 2007 is a sign of what Israel will need to do one day to stop Iran's nuclear program. It also asks: had Israel not carried out this mission, what would the Middle East look like today?